Kevin Sheridan is a New York Times Best Selling Author and one of the most sought-after voices in the world on the topic of Employee Engagement. For four years running, he has been honored on Inc. Magazine’s top 101 Leadership Speakers in the world, as well as Inc.’s top 101 experts on Employee Engagement. Having spent thirty years as a high-level Human Capital Management consultant, Kevin has helped some of the world’s largest corporations rebuild a culture that fosters productive engagement, earning him several distinctive awards and honors. Kevin is a frequent keynote speaker at national and international conventions, including those hosted by the Society for Human Resource Management, Harvard Business School, Monster.com, The Human Capital Institute, the American Hospital Association, Chicago SHRM, and HRMAC. 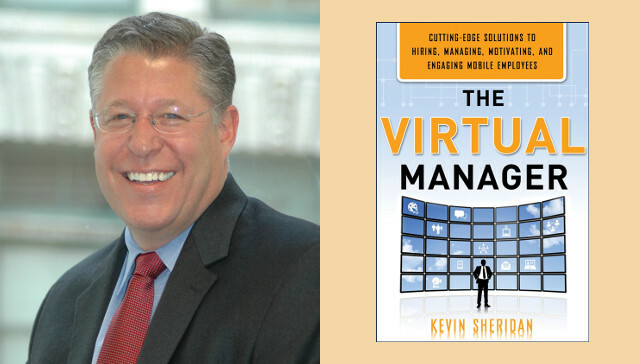 He is also the author of The Virtual Manager, which explores how to most effectively manage remote workers. Kevin also enjoys golfing, fishing, and high-altitude mountaineering. He is in the process of climbing the highest mountain on every continent, an athletic journey known as “The Seven Summits.” He lives with his wife and two daughters in Winnetka, Illinois. 1MFWF: What sparked your commitment to/interest in flexibility in the workplace and virtual work in particular? Ashley asked me if I trusted the employees at my company and I said “yes.” She then asked me to “let go” and I did. As long as I was getting the desired outcomes from the staff, it really did not matter where they were. As I say in my book, The Virtual Manager, “work is what you do, not where you go.” I’ve never regretted it since. 1MFWF: When does it make sense for a manager to establish a virtual staff? Kevin: The answer is simple: When you want greater business success. Often, virtual work is not an option, but a necessity to gain market share. Global organizations are able to provide better service and ultimately a better product when employees live near clients and customers and fully understand their needs. Having a team of remote and virtual employees is a great fit for global business because everyone benefits; employees, clients, and the company as a whole. Employees enjoy the perk of added flexibility, while clients and customers are able to work with local employees anywhere across the globe. In addition, the organization benefits because it is able to recruit from around the world, allowing it to hire some of the most talented people in the industry. Whether your organization establishes virtual teams in order to meet clients on-site, or to reach a wider customer base and gain a competitive advantage, remote employees will have an impact on your organization. Virtual workforces are the future, and they are your best option for the greatest business success. In fact, as of 2016, 40% of the global workforce is remote. By 2020, fully 50% of the global workforce will be virtual. 1MFWF: What are some of the characteristics an employer should look for in a virtual employee? Kevin: Some of the best predictors for onsite employee engagement are the same for employees in a virtual position. Passion, loyalty, professionalism, and applicable skills and knowledge are all essential characteristics for contributing to a magnetic culture. But a virtual environment is vastly different from working onsite, and a predisposition to be engaged is often not enough. Self-Starters. Self-starters don’t have to be reminded to work, nor do they call their boss and ask what to do next. They seek work. Whether in the office, at home, or at a café, they don’t need their boss working in the next room to keep them on task instead of on Facebook. Self-starters recognize it is their job to contribute to a magnetic culture, and therefore they always strive to perform their best work. Their assumption is that they should be doing something at all times to earn their paycheck. Self-Motivated. Self-motivated employees don’t need a carrot dangled in front of them to do a good job. They are intrinsically driven by a big-picture goal. While the goal can be anything from getting a promotion to paying off student loans to taking pride in a job well done, self-motivated employees have an ex­traordinary sense of purpose. This makes it easy for them to ignore the distractions of their remote office, zero in on the tasks at hand, and deliver top-notch results. Self-Disciplined. Self-disciplined employees have superior long-term focus, stellar time management, and a strong sense of what’s most important in reaching goals. They are able to forego immediate pleasure and instant gratification (like watching TV or taking a mid-afternoon nap) in favor of a more meaningful outcome. They spend time on activities that bring them closer to accomplishing their goals, and their workdays are highly structured. Hiring self-disciplined employees frees you from watching over virtual shoulders and breathing down virtual necks. Self-Sufficient. Working offsite makes it harder to get support and feedback from colleagues. While this reality can be incredibly tough for some, self-sufficient employees do just fine. These individuals are engaged despite very little social interaction with peers and managers. They do not need to sound their ideas out loud with a manager, toss a question over the cubicle wall, or pop into a colleague’s office for a conversation. They are remarkably adept at figuring things out on their own, and when they can’t, they’re content emailing or calling. Self-sufficient employees are easy to manage remotely because they need little assistance and they don’t rely on coworkers for a boost of morale. When interviewing for a virtual role, make sure to ask behavioral questions to assess these four “self” characteristics. 1MFWF: Why is diversity, as you note, an “unavoidable outcome of virtual teams,” and why is it important to build a culture of inclusion? Kevin: Simply put, working remotely can be very lonely, with the virtual worker feeling isolated, separated, excluded, and forgotten about. Therefore, great Virtual Managers proactively go out of their way to include, engage, and recognize employees who work afar.